Have you ever felt that you’re sleeping more or less than usual, eating more, feeling restless, loss of energy and interest in daily life, feeling hurt easily, feeling guilty excessively, losing interest in activities and have trouble concentrating? The Hypericum Perforatum homeopathic medication could be right thing for you! Hypericum Perforatum is most commonly known as St. John Wort is a wild yellow flower grown throughout most of the United States. It has been used for medical purposes in many parts of the world for thousands of years. 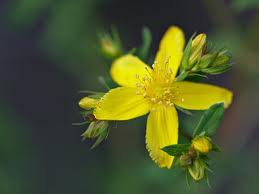 Hypericum is also found in oil and spray form which helps treating cuts and bruises, first degree burns, sunburns, relieves nerve pain, shingles, and muscle strains. The homeopathic medicine is also used in alleviating stomach upset when taken by mouth. Hypericum could be used in bladder troubles and suppression of urine and diarrhea. Homeopaths generally use hypericum to treat injuires and provide pain relief. Herbalist use this medicine to treat depression and mood disorders. Today, St. John's Wort is being studied to alleviate mood disorders and anxiety. More than 30 clinical studies have been conducted over the past 22 years. Short-term studies suggest that St. John's Wort is more effective than placebo, and equally effective as Tricyclic antidepressants, medication used by doctors to treat depression. The first line and most common drug of choice prescribed by doctors for depression is SSRI. However, the FDA has been aggressively warning us that SSRI's are increasingly linked to liver disease, sleep problems, and sexual side effects. Therefore from the scientific research St. John's Wort revealed fewer side effects and also may be just as effective as SSRIs. Hypericum Perforatum (St. John’s Wort) could be used for many symptoms of depression. Backing with scientific evidence that St. John's Wort is helpful in treating moderate depression and it is a safe homeopathic medicine to use on skin, muscle, stomach, and bladder. This is the reason why currently Hypericum is used by millions of people around the world.